The Kamta A luxuries and leisurely family vacation, a quick corporate assemblage. A family budget hotel. Safety, honesty and reliability makes us the best choice for a comfortable and memorable vacation in India. A Cascade of courtesy and warmth enfolds you at the reception. The Guest relation officer there can help you with all your travel queries. We provide for end to end guest care as per the hotel norms. The Facilities and ambiance of Hotel The Kamta enchants the business and the leisure traveler alike the luxurious lifestyle experiences for you. An exquisite blend of business and pleasure, it`s the perfect place to confer, relax or rejuvenate your senses. Palace interiors will enchant you.Where every member of the staff and every facility is dedicated to make you return to this boutique Hotel. Time after time. We are one of the finest 3 star facilities Hotel in Bhagwan Xing, Agra. Hotel The Kamta offering a unique blend of Indian and Asian hospitality. 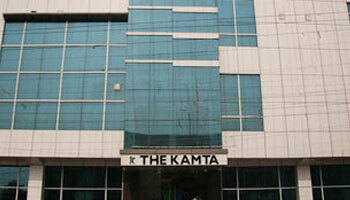 Hotel The Kamta welcomes you to Agra for an enticing experience. Our luxury budget hotel is strategically located in the heart of the business and commercial hub of Agra and provides easy access to most of the mounments of Agra and corporate and financial centers. Hotel The Kamta is the perfect destination for an international traveler looking for easy access to doing business in Agra. 25 large, spacious rooms and suites elegantly embellished with modernistic furniture , gorgeous interiors complemented excellently with satellite Televisions, Telephone with direct dialing facility and refrigerators give our rooms a feeling of romanticism and grandeurs. A team of vigilant executives attend to your concerns no matter what hour of the day. The courteous conduct and warm attendance exudes a home like atmosphere. Your safety and hygiene are some of our foremost concerns and hygiene are some of our foremost concerns. 9.7 KM From Kheria Airport, 0 KM From Agra Cantonment railway station 0 KM, 0 KM from ISBT | 2.7 km from Raja Ki Mandi train station, this relaxed hotel is 5 km from Agra Fort and 9 km from the Taj Mahal. Airport Transportation, Currency Exchange, Breakfast Services, Travel Counter, Parking, Security Guard, Doctor on Call, Laundry Facilities, Backup Generator, Room Service. Attached Bathroom, Toothbrush/Razor on Request, DVD Player, Cable/Satellite TV, H/C Water, House Keeping, Wakeup Calls, Iron/Ironing Board, Air Conditioning Room.